The Italian Alpine Club has a long history in our country. In 1946 the subsection of Sovico was officially founded, it was a part of the Section of Monza. It was a wonderful period for climbing thanks to the "SPIDERS" from Lecco and "PELL OSS" from Monza. 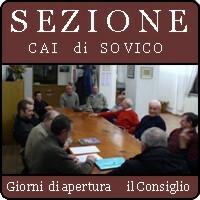 Some of them took part in Sovico's meetings such as Oggioni Sovico. The subsection was dissolved in 1964 and the participants joined other sections. In 1979 a group of members of the former section founded the "Group Excursion Edelweiss" to spread the passion for the mountains. 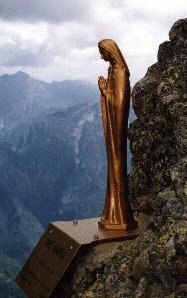 The Edelweiss season was very successful because they organized excursions, ski championship, the pose of the statue representing Madonna it was blessed by Don Carlo Gussoni near the fireplace in the Folat July 20, 1980. In 1984 Giuseppe Cazzaniga from Edelweiss informed all the members that the CAI of Milan was looking for managers trying for a little hut in Valmalenco, called Refuge "Del Grande-Camerini". The Edelweiss promoted registrations until they got more than 100 members and they were finally able to be recognized as a new section of CAI by the headquarters in February 11, 1985. In 2010 the Section of Sovico celebrated the 25th anniversary, the presidents that have occurred over time, are: Enrico Ferrario, Francesco Riva, Pietro Villa, Sergio Mariani, Nino Rossi, Stefano Vertemati until the current President Valter Zorloni. Some important figures in the history of our Section were : Enrico Ferrario, first President of the Subsection, the geologist Arturo Riva, Pietro Villa, president of Edelweiss. Another important character is Enrico Resnati with his great passion for the mountains, who died on Resegone in 1966.